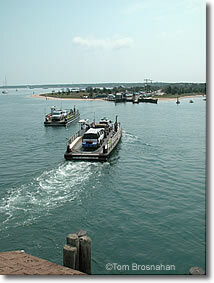 The "Chappy Ferry" takes you from Edgartown to Chappaquiddick Island on Martha's Vineyard in less than five minutes for a few dollars, but the line to get on is long in summer. The channel between Edgartown Harbor and Katama Bay on Martha's Vineyard island is not wide at Edgartown (map), allowing simple three-car ferryboats to shuttle cars, passengers and bicycles across the water to Chappaquiddick Island in only a few minutes. The twin ferries On Time II and On Time III are indeed always "on time," because the ferries have no set schedule (and thus can't be "late" or "early.") Except for late at night, ferries operate whenever cars and passengers need to cross. In summer, especially on weekends, lots of cars and passengers want to get over to—or return from—Chappaquiddick Island and its wildlife refuges, nature reserves and beaches, so the waiting line and waiting time for the ferry can be very long. 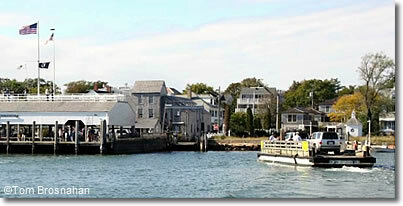 All fares are round-trip, payable before boarding the ferry in Edgartown. Car-and-driver pay, and each person crossing on the ferry pays. There is a charge for bicycles as well. As a pedestrian, you pay a few dollars as you walk on the ferry from Edgartown, and you just walk on again when you return from Chappaquiddick. No ticket, stub or receipt needed. Driving a car, you receive a ticket, which you must surrender to ferry staff before boarding the ferry in Chappaquiddick for the return trip. Chappy Ferry: always "on time."